In Afghanistan, the climate is usually arid continental, with cold and relatively rainy winters (and a rainy peak in spring) and hot and sunny summers. However, there are substantial differences depending on area and altitude: the south is desert, many areas are rather cold because of altitude, and the far east is relatively rainy even in summer, since it is partly affected by the Indian monsoon. Precipitation is generally scarce, at semi-desert or desert levels, except in the eastern regions, where it exceeds in some areas 500 millimeters (20 inches) per year, while in the far east, near the border with Pakistan (Kunar and Nurestan provinces), it even reaches 1.000 mm (40 in). During winter, the center-north of the country (and more rarely the south) is reached by disturbances of Mediterranean origin, which bring a bit of rain, and even snow, more likely in the mountains. In early spring, when the southern Asian landmass starts to warm up, the clash between air masses becomes stronger, so rainfall increases; in fact, March is often the wettest month. Later, the rains decrease, and from June to September, it usually never rains. Only in the easternmost region, east of Kabul, owing to the last offshoot of the monsoon that affects India and Pakistan, there is a certain increase in rainfall in July and August. In the northern plains (the ancient Bactria), crossed by the Amu Darya River, which marks the border with the former Soviet republics, the climate is continental, with cold winters (but the average daily temperature exceeds freezing also in January) and very hot summers. In winter, however, cold waves are possible, with peaks of -20/-25 °C (-4/-13 °F). Summer is really hot, with peaks of 45 °C (113 °F) and even more, and sunny. Here are the average temperatures of Mazar-i-Sharif, located at 360 meters (1,200 feet) above sea level. Rainfall is scarce and occurs in winter and spring, with a maximum in March, when the clash between air masses can sometimes cause strong winds as well. Here is the average precipitation. In Mazar-i-Sharif, the sky is normally clear in summer, while in winter, the sun does not shine very often. Here are the hours of sunshine per day. Afghanistan is a mountainous country, and it's crossed by the range of Hindu Kush in its various chains, but also by the Pamir in the far north-east, in the frigid Wakhan Corridor, near the border with China. Many cities, starting from the capital, are located in narrow valleys, shaped by rivers between the mountains, at higher or lower elevations. In the country, there are many very high peaks, among which Noshaq, 7,492 meters (24,580 feet) high, Shar Dhar, 7,038 meters (23,090 ft), and Lunkho e Dosare, 6,901 meters (22,641 ft), all three at the border with Pakistan; we can also mention Kohe Bandaka, 6,843 meters (22,451 ft), which is 25 km (15 mi) away from the border with Pakistan. At high altitudes, above 4,000 meters (13,000 feet), there are vast glaciers. Here are the average temperatures of Bamyan, situated at 2,500 meters (8,200 feet) above sea level, 125 km (77 miles) north-west of Kabul. As we can see, winter is freezing, and although the temperature rises quite a bit in summer, nights are still very cool or even cold. West of Bamyan, and at 3,000 meters (10,000 feet) above sea level, we find the six lakes of Band-i-Amir, protected in a national park. The capital, Kabul, is located at a high altitude, 1,800 meters (5,900 feet) above sea level. Winter is cold, with an average temperature in January of -1 °C (30 °F), usually with freezing nights, and with possible peaks of -20/-25 °C (-4/-13 °F); snowfalls are fairly frequent and sometimes heavy. Summer is hot during the day, sometimes scorching, but nights remain usually cool. Precipitation in Kabul, fairly low, amounts to 300 mm (12 in) per year. The rainiest season is spring. In summer, it almost never rains. Here is the average precipitation. In Kabul, the sun shines quite often even in winter, while in summer, it regularly shines. Herat is located in the west, in the Hari River Valley, at about the same latitude as Kabul, but at a lower altitude, 900 meters (2,950 feet). Winter is cold, but the average temperature is above freezing. Sometimes it snows, but more rarely than in Kabul. Here too, cold spells with intense frosts are possible in winter. Summer is hot and sunny, and characterized by an intense and frequent wind that blows from the north, the "wind of one hundred and twenty days" (Bad-i-Sad-u-Bist-Ruz), which blows in the west of Afghanistan in the warm season, from June to September, raising sand, dust, and salt. 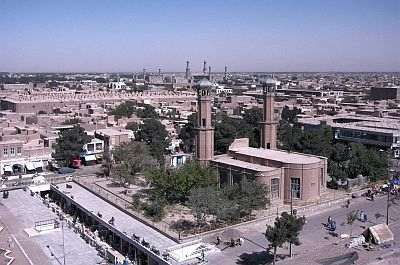 In Herat, precipitation is scarce and amounts to 240 millimeters (9.5 inches) per year. It never rains from June to September, but autumn is dry as well. Here is the average precipitation. In winter, the sun in Herat shines a little less often than in Kabul; in the rest of the year, it shines regularly here as well, especially from May to September. In the south of Afghanistan, the climate is warmer, and snowfalls in winter are rare. In Farah, located in the south-west at 750 meters (2,460 feet) above sea level, the average temperature ranges from 8 °C (46.5 °F) in January to 33 °C (91.5 °F) in July. In Kandahar, located in the southeast, near the desert, at 1,000 meters (3,300 feet) above sea level, the daily average temperature ranges from 6.5 °C (43.5 °F) in January to 31.5 °C (88.5 °F) in July. Winter is mild enough, even though it's cold at night, with possible frosts. Summer is scorchingly hot, and as usual it's sunny. Rainfall in Kandahar is very poor, since it doesn't reach 200 mm (8 in) per year. In practice, the only relatively rainy period is from January to March. Here is the average precipitation. In Kandahar, the sun frequently shines throughout the year, but especially in the long hot and dry period from May to October. South of Kandahar, there is a wide desert area (regions of Sistan and Baluchistan), occupied by a plateau at an average altitude of 500/700 meters (1,600/2,300 feet) in the western part, where we find the Dasht-e-Margo ("desert of death"), and between 700 and 1,200 meters (2,300 and 4,000 feet) in the eastern part, where we find the Rigestan Desert. In the middle, the Helmand River flows, along which some cities are found. Rainfall drops to around 80/100 mm (3.1/4 in) per year in the northern part and as low as 45/50 mm (1.8/2 in) in the southern part. Here are the average temperatures of Zaranj, located in the province of Nimruz, near the border with Iran, 500 meters (1,650 feet) above sea level. The best times to visit Afghanistan are spring and autumn to avoid both the winter cold and the summer heat, generally, the months of April and October (and even March and November in the southern deserts). However, in these months, it can get hot during the day and cold at night. Autumn is preferable because it is drier and less windy. You can visit the mountainous areas above 2,000 meters (6,500 feet) in summer, which is definitely the best season at the highest altitudes (since in the rest of the year the cold dominates), with the exception of the far east, which in summer is affected by the offshoots of the monsoon. 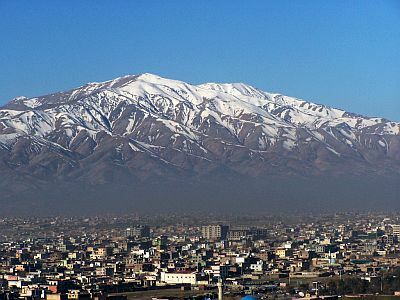 In winter: for Kabul and the mountains, bring very warm clothes, such as a down jacket, a hat, a scarf, gloves; for the plains of the north and Herat, you can add a lighter jacket for mild days; for Farah and Kandahar, warm clothes, such as a sweater, a coat, and a hat; for the deserts of the south, a sweater, a jacket, a warm jacket for the night, and a scarf for the sand. In summer: for the plains of the north and the main cities of the plateau, bring lightweight clothing of natural fibers for the day, a hat for the sun, a desert turban, a sweatshirt for the evening. In Kabul, you can add a jacket for colder nights. For the high mountains above 4,000 meters (13,000 feet), bring a down jacket, a hat, gloves, and a scarf. For the Kunar Province, a raincoat or umbrella. When visiting mosques, you must keep your shoulders and legs covered, and take off your shoes. Women should avoid low-cut dresses.